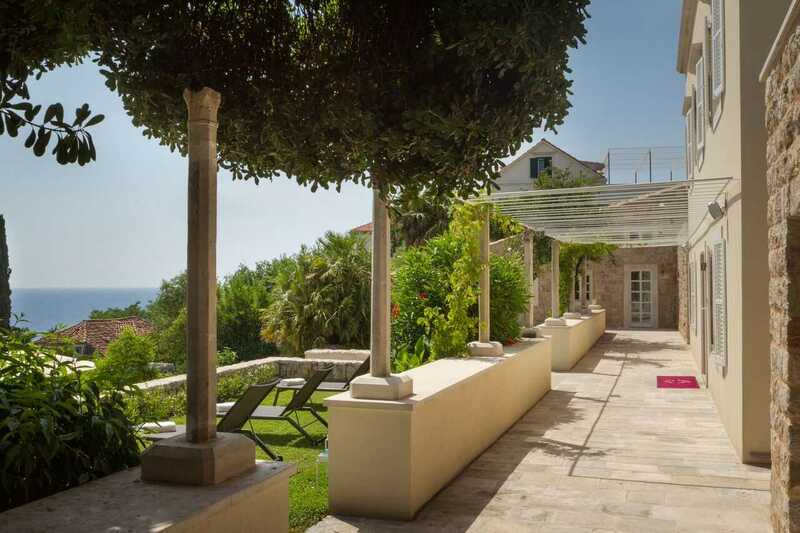 This 7 bedroom – 14 person Luxury Villa Dubrovnik Old Town with pool and sea view sits in an elite and private residential neighborhood of Dubrovnik, only 200 meters away from one of the most celebrated sites in Croatia – Dubrovnik Old Town. 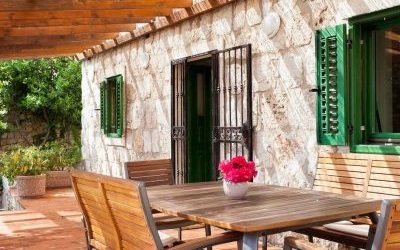 Within a short stroll, you are close enough to enjoy the Old Town’s stone beauty, fascinating sites and lively summer atmosphere, yet just in the right spot to wind-down at a peaceful, relaxing retreat. 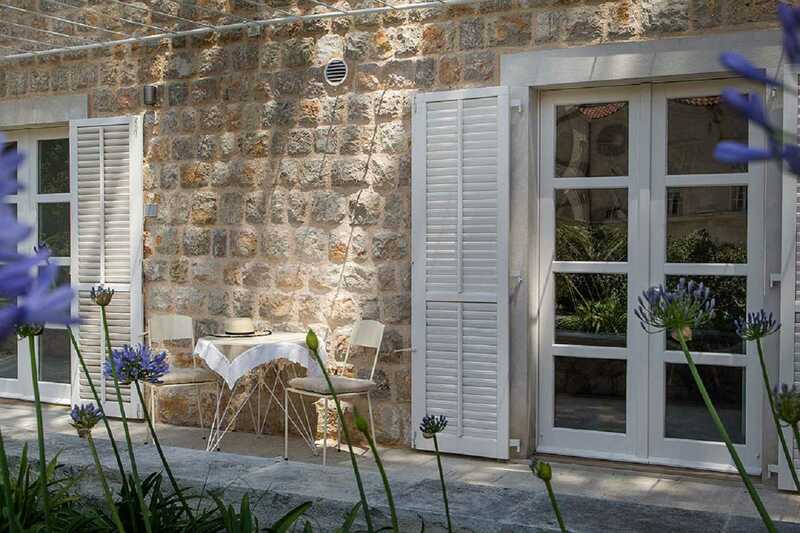 Ideal for all those who appreciate a touch of privacy and modern comfort – all within walking distance of Dubrovnik’s main attractions and city centre. 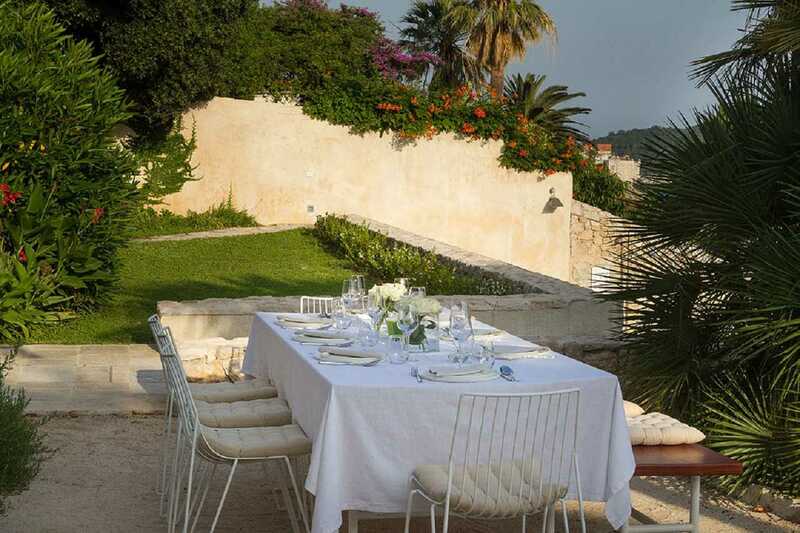 Quite comfortably, Luxury Villa Dubrovnik Old Town with pool can host all types of small groups, such as families, groups of friends, smaller business or incentive groups, and private events. 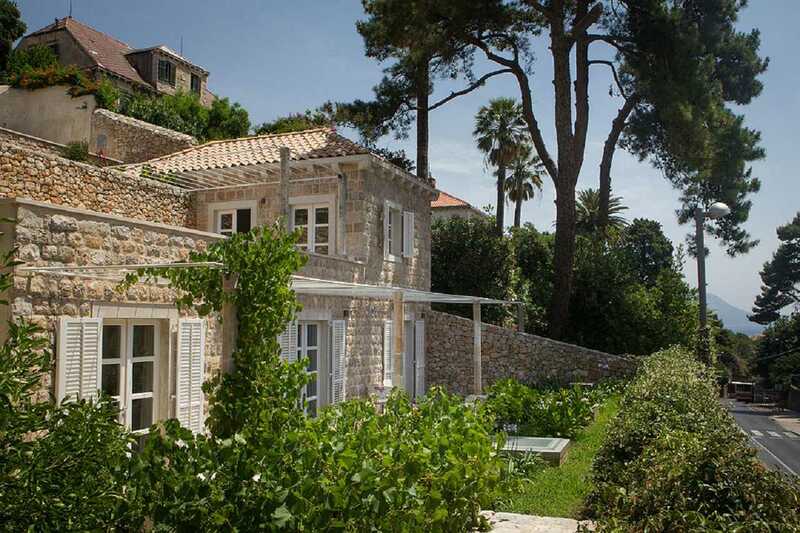 The intriguing and diverse nature of the Luxury Villa Dubrovnik Old Town with pool property features 4 double bedrooms in the master house plus 3 independent accommodation units, a sauna, pool, lounge decks, conference room, garage, professional kitchen and an open-air barbecue. Everything you need to let your imagination create an ideal vacation. 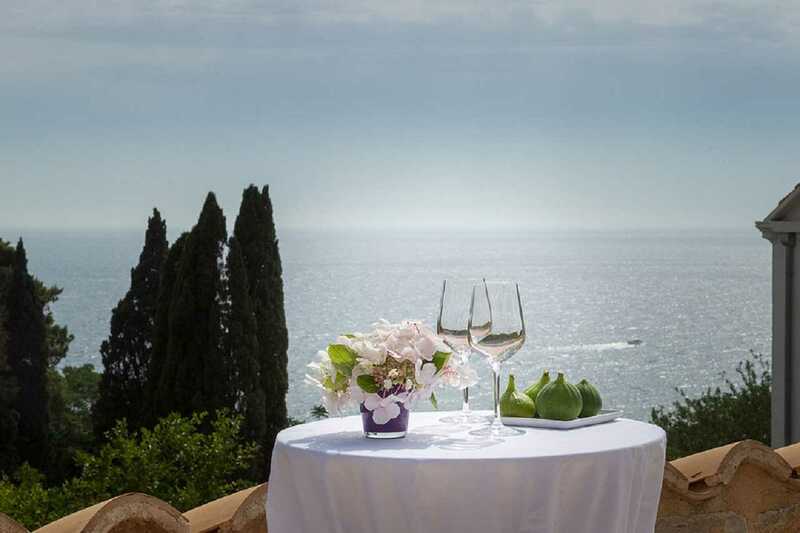 A cocktail party or a romantic private dinner on the terrace. 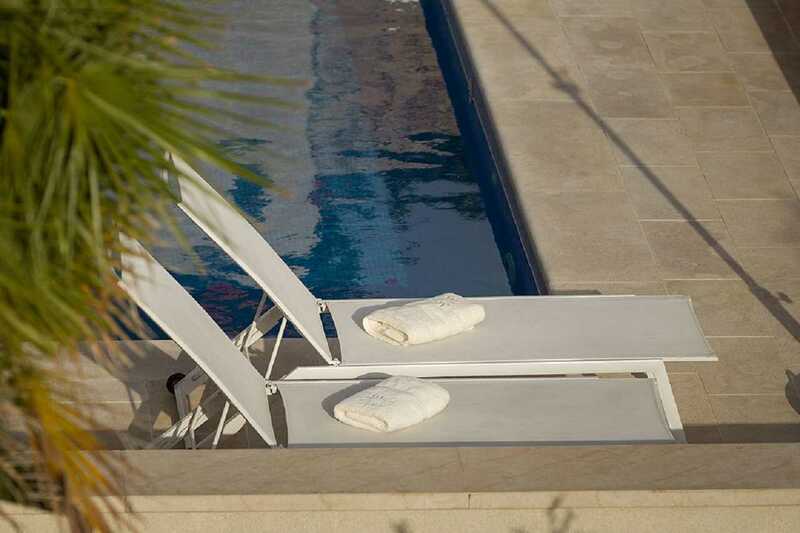 Relaxing yoga exercises outdoors, tranquil moments by the pool or a business meeting. 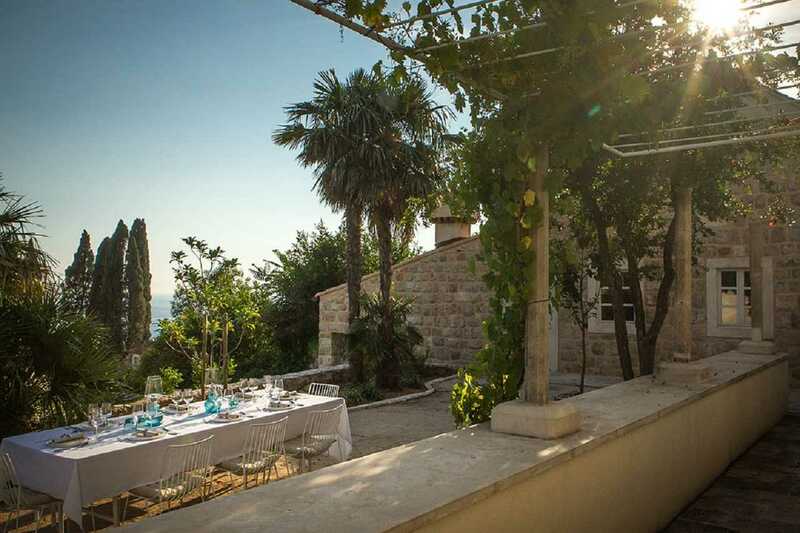 Live-in staff taking care of every detail, custom tailored trips exploring the region – whatever you choose, Luxury Villa Dubrovnik Old Town with pool and sea view is all about a variety of great choices for your unique Dubrovnik experience. 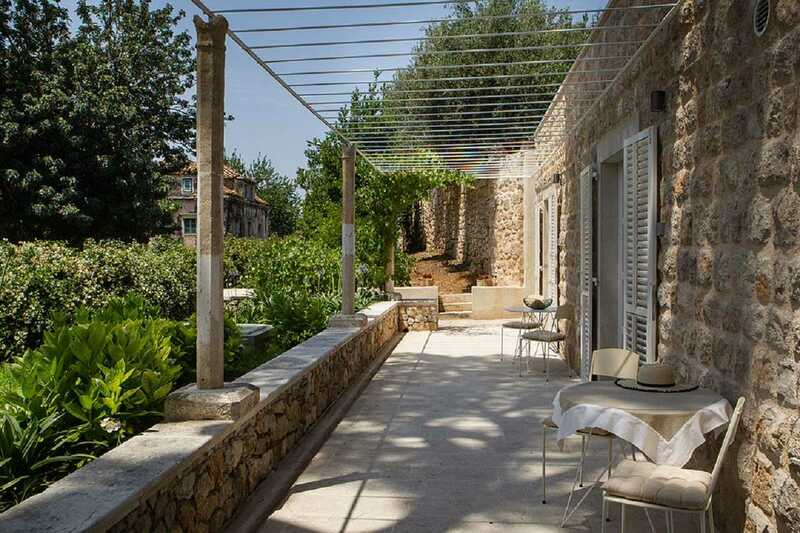 This town estate has been developed in an area known as Dubrovnik’s historic gardens, where fresh fruit and vegetables were grown for the town as early as the 13th century. Some 200 years ago, parallel to the opening of the road below and construction of the Old Hospital – which is today the University of Dubrovnik, Villa gets its present day layout. 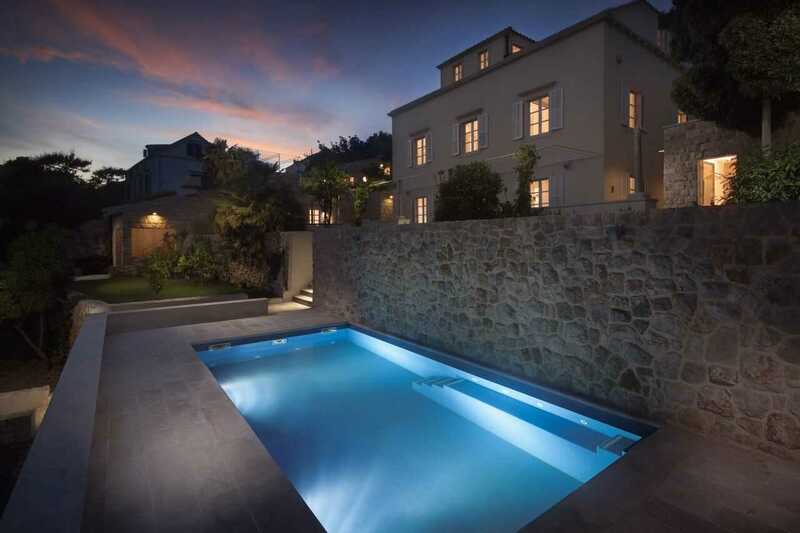 This is comprised of the master house and garden terraces with several independent units. 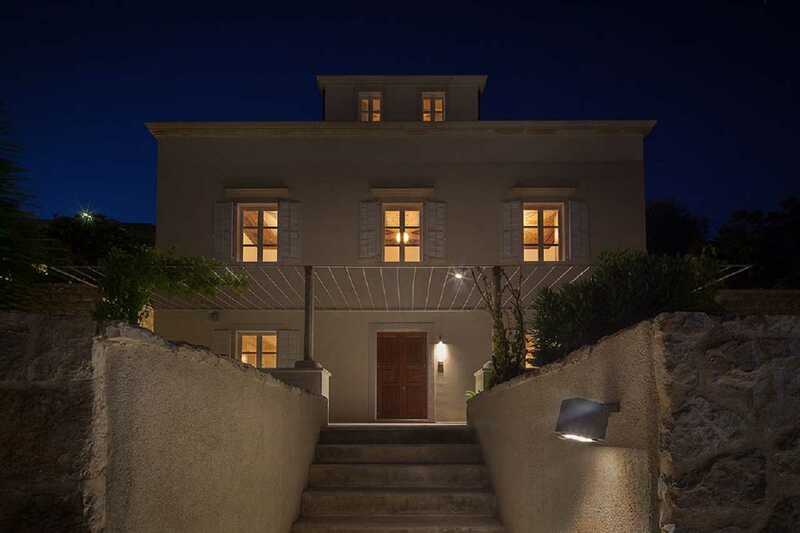 Unaltered for the majority of the 20th century, recently Villa was carefully restored, brought back its former glory of a typical 19th century town residence. Some of the original details in the master house vividly evoke those times gone by: glass double doors facing the main entrance, cast-iron handrails along the central staircase and floor mosaics. 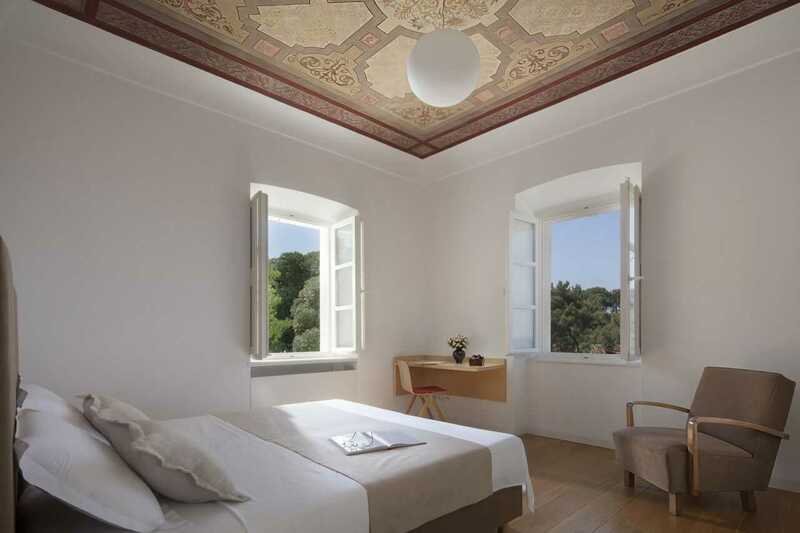 The bedrooms feature ceiling paintings, and you also find stone and wooden staircases. 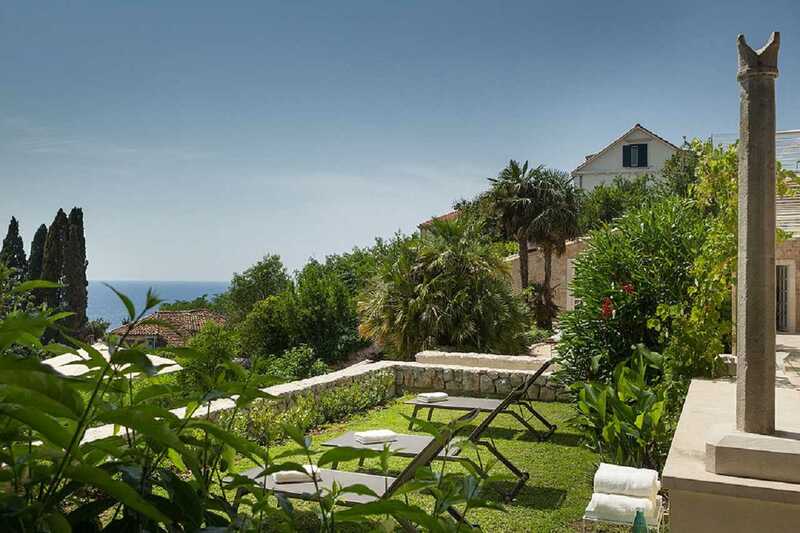 The wonderful hillside terraced gardens, which lushly embrace the master house, are typical of Dubrovnik holiday villa Croatia. 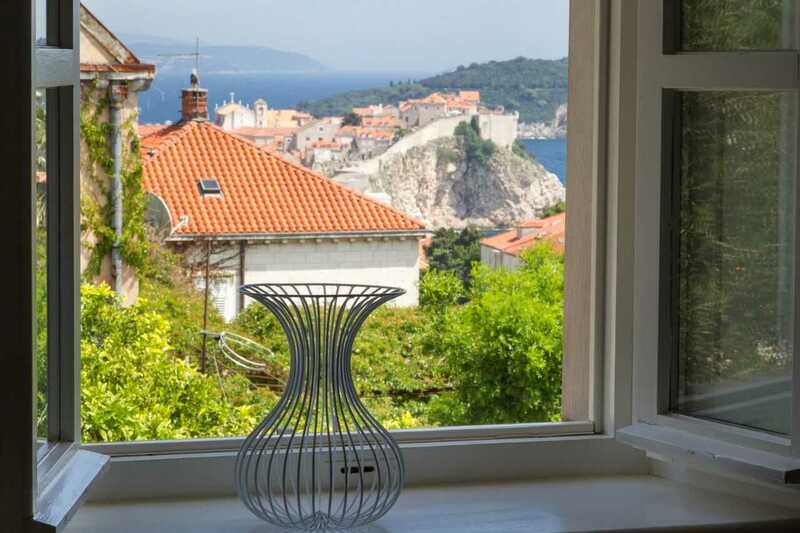 Given its vicinity to the UNESCO protected Old Town, this area is under close supervision of Croatia’s Ministry of Culture. 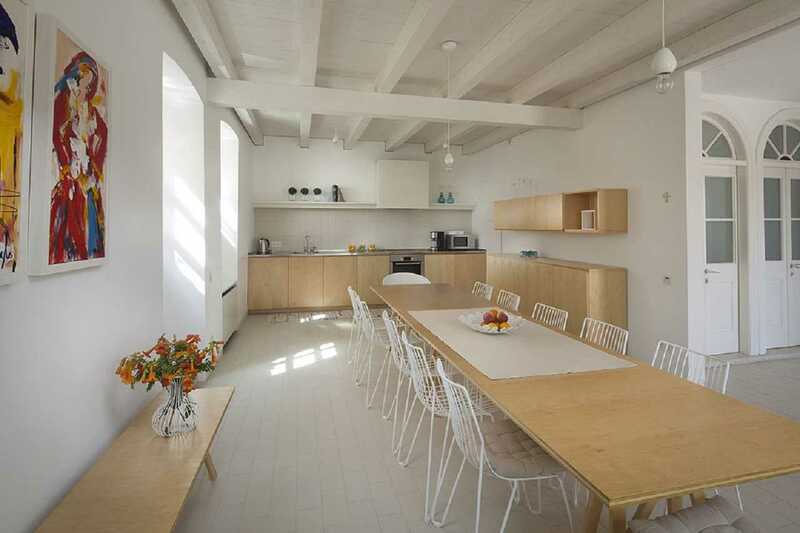 This highlights why the renovation was undertaken with the utmost care in strong collaboration with numerous restoration experts and the local Department of Conservation. 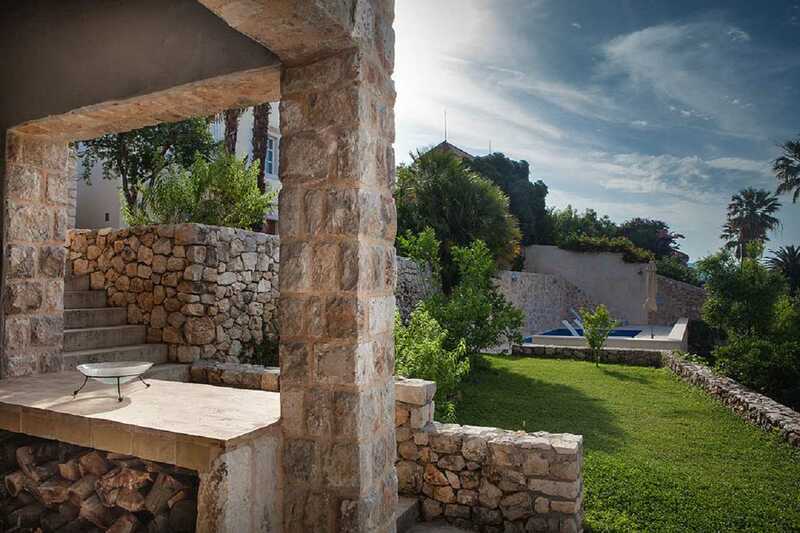 Still, the present day Luxury Villa Dubrovnik Old Town with pool was designed in a contemporary style, fully air-conditioned and equipped with all top-notch appliances necessary for maximum comfort. 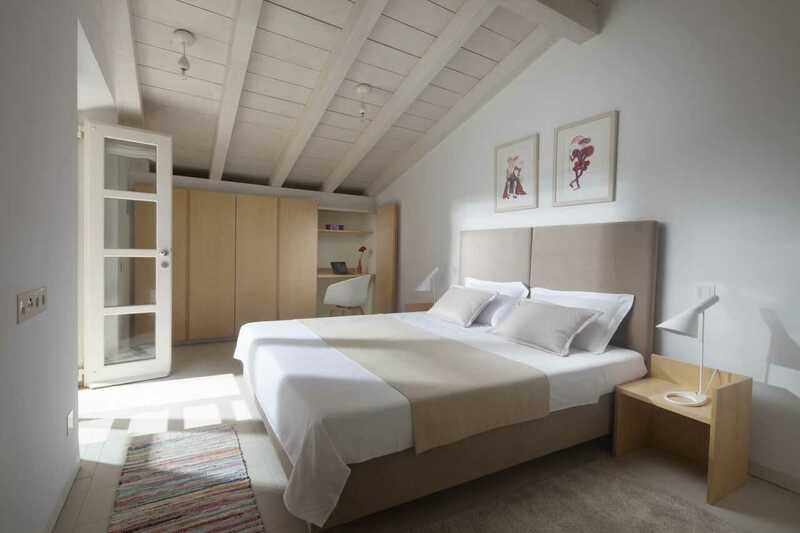 It provides guests with a subtle historical dimension skilfully fitted to modern travellers’ expectations. 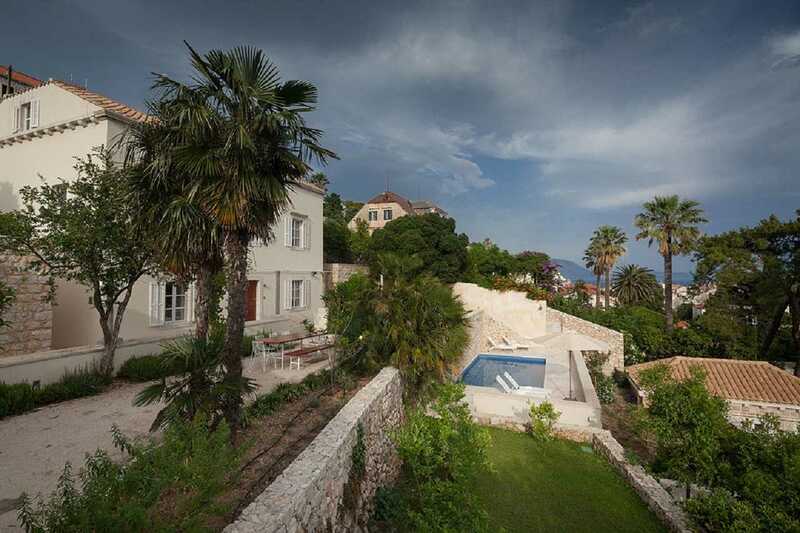 Villa in Dubrovnik Croatia sits between two streets, both ultimately leading to the Old Town. Enjoy the calm and serene promenade on the upper street, historically called Garden Street. 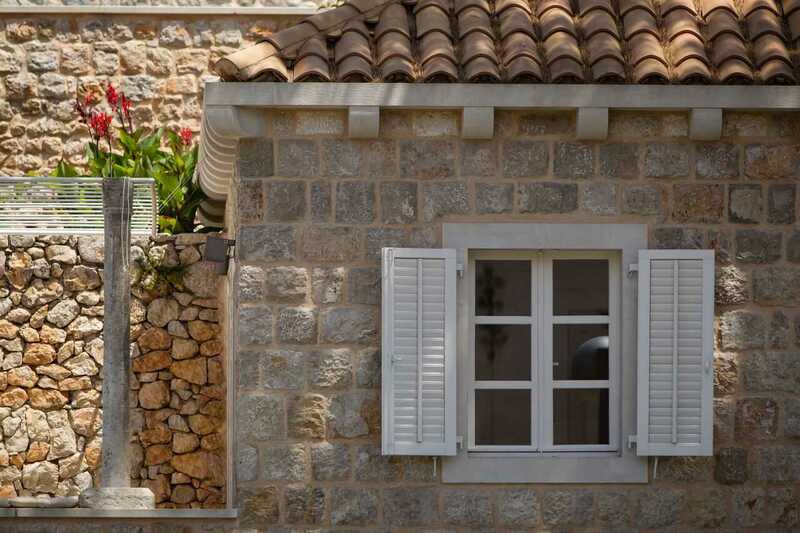 Passing among historic estates and current residences, the walk resonates a true spirit of living in Dubrovnik. The frequented road below Luxury Villa is the main connection between the Old Town and other parts of the city. 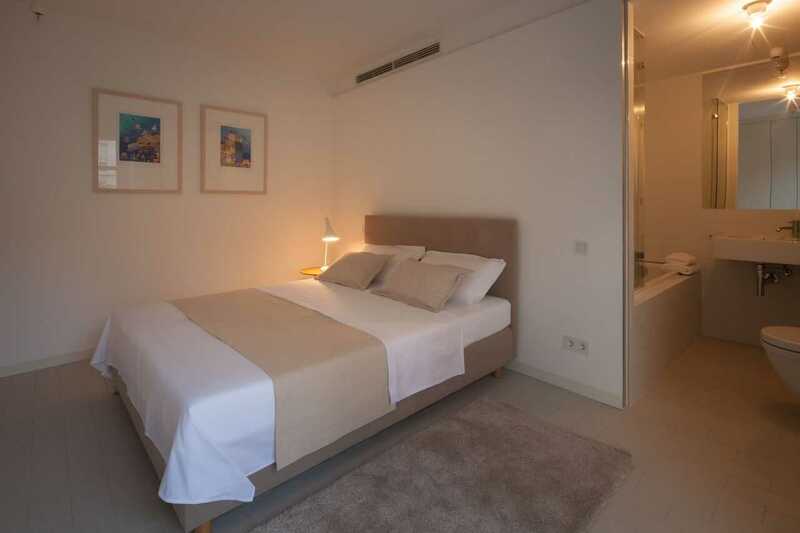 Approaching from this side, the spacious garage with 4 parking spots makes Villa convenient for all those with their own transport while in Dubrovnik, resolving the ongoing problem of insufficient parking. 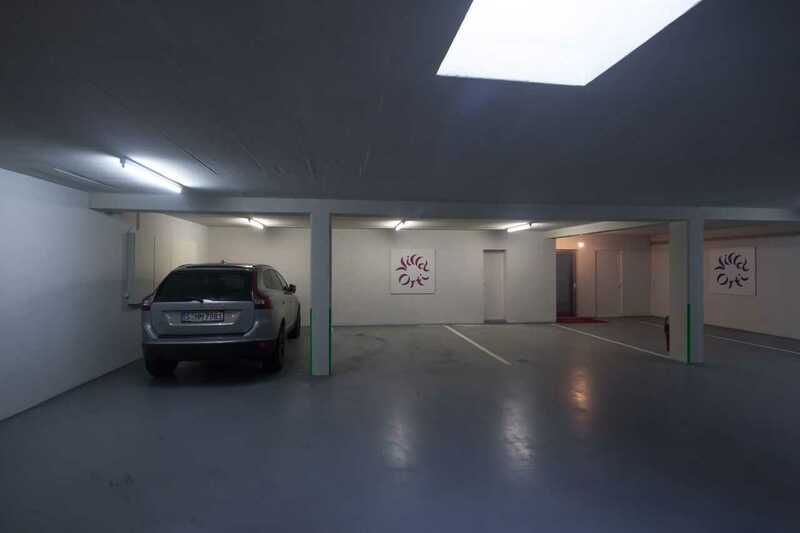 From the garage, take the elevator to the conference room two levels up or enter through the main gate. Passing the main gate, five green terraces open up on each side of the central stone staircase leading up to the master house. 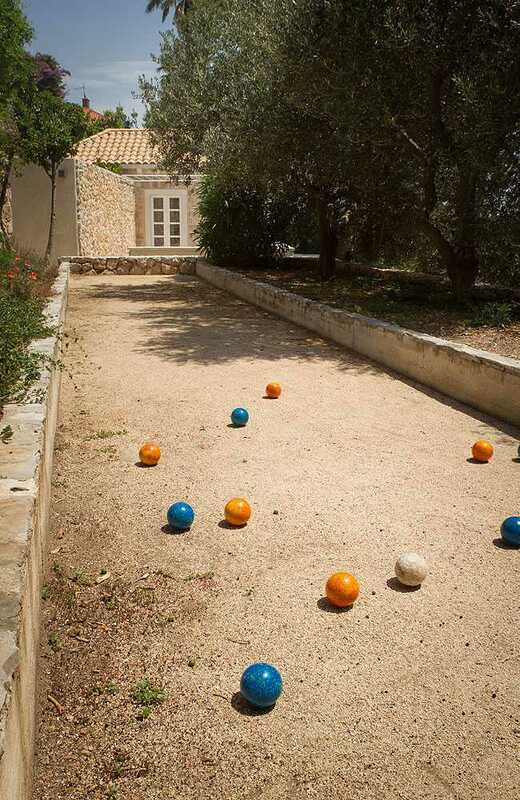 This is a mesmerizing view: stone-lined greens of typical Mediterranean sorts such as citruses, loquat, pomegranate and lavender. View the herb gardens and amenities like the private pool, lounge deck, bocce field, and conference room. 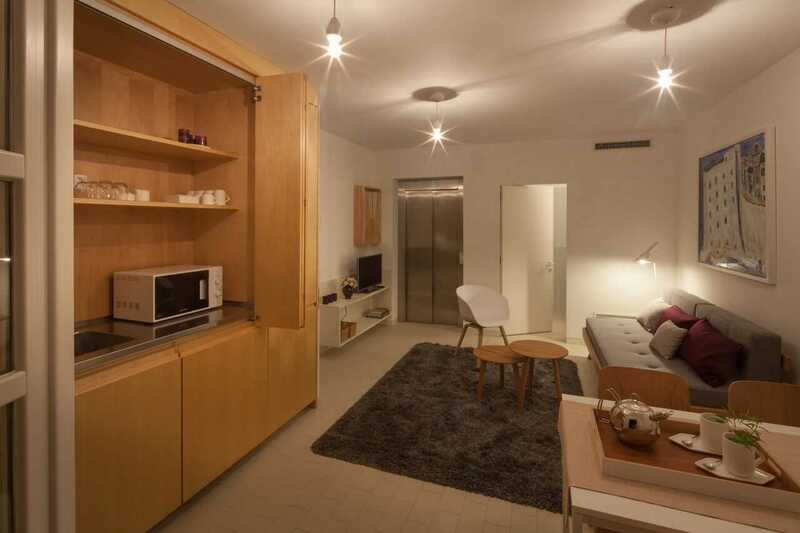 The level above the garage holds two independent accommodation units – one suite and one bedroom with a bath. 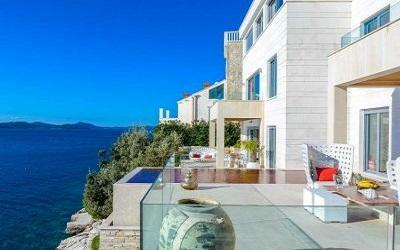 Both share a large stone terrace overlooking the historic University of Dubrovnik. 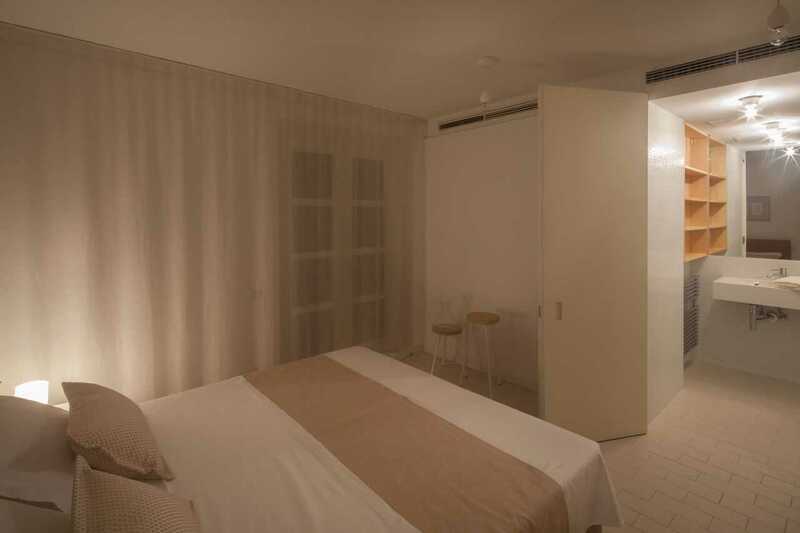 Allowing for extra privacy, this area is simply ideal for support staff or members of the group looking to have some time alone. Ascending to the master house level, the promenade in front of the house is shaded by vines and a lush bougainvillea tree. 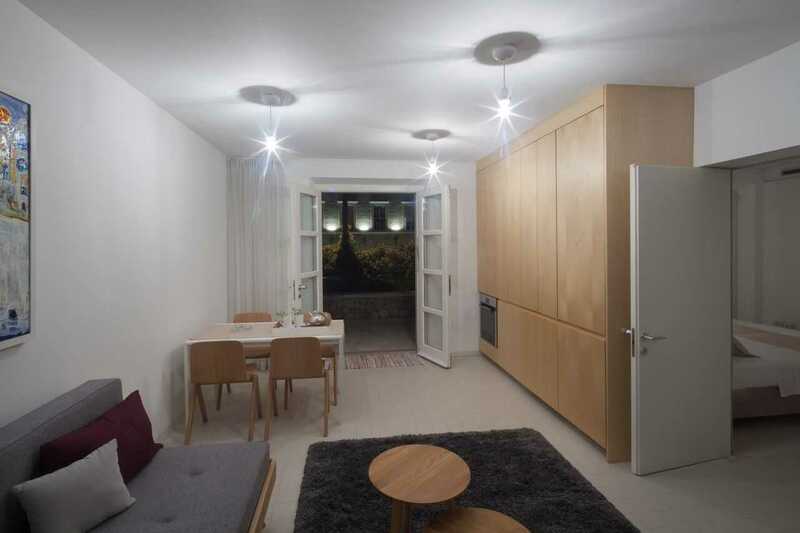 This positively adds a touch of liveliness to the otherwise serene atmosphere. 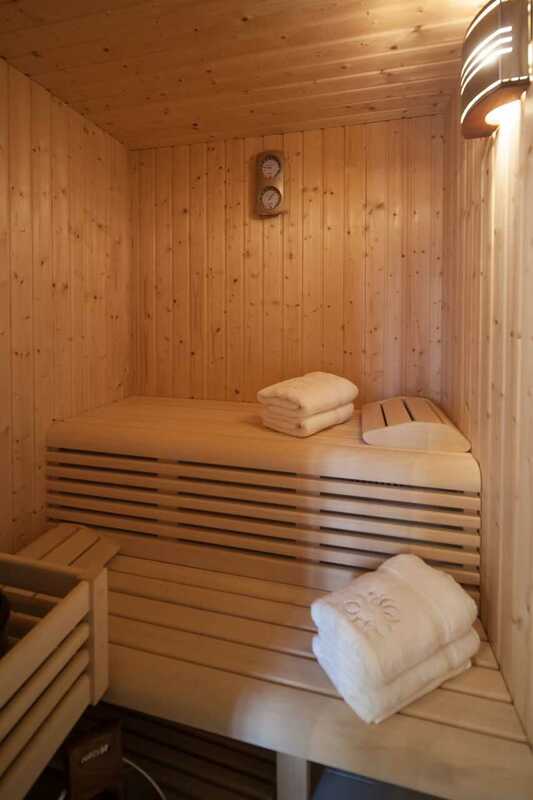 The promenade runs between the sauna on its right end and another independent suite on the left end, featuring shade, seclusion and an intimate atmosphere. 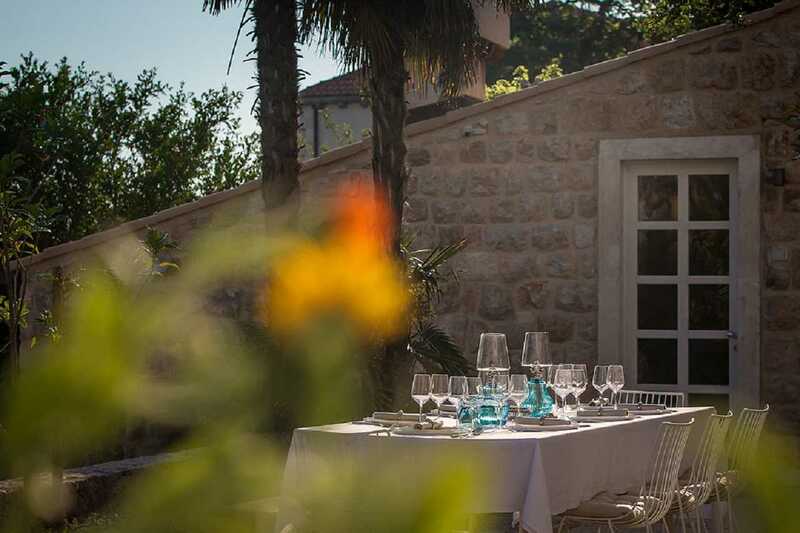 Below the suite, take advantage of a fully equipped professional kitchen and open grill area providing catering for smaller events at Villa or perhaps something more elaborate, such as a la carte private dining events. 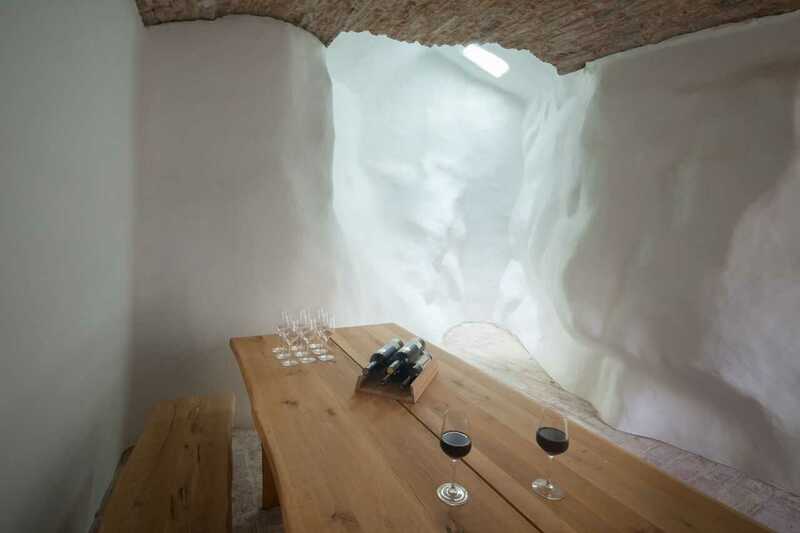 To the left of the main house, the historic cistern, carved in live rock, was redesigned as a minimalist interior space. 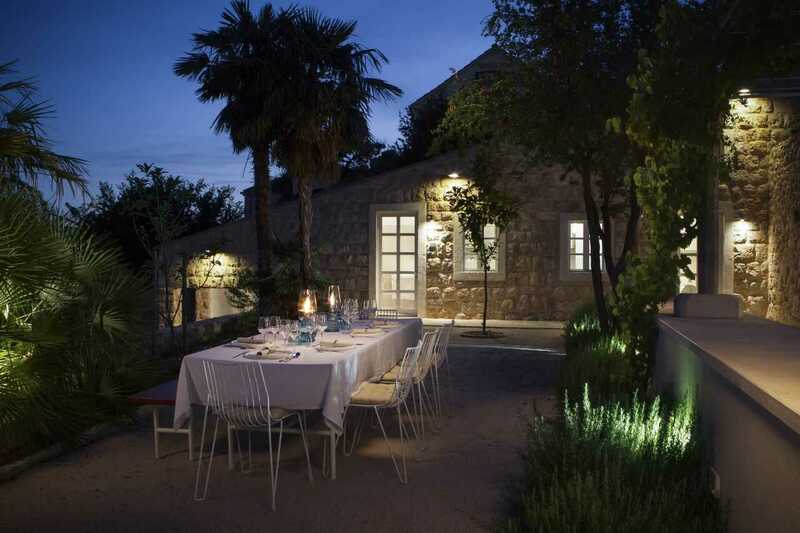 With a simple table, this area provides the ultimate cool-down spot, perfect during those hot Dubrovnik summers. 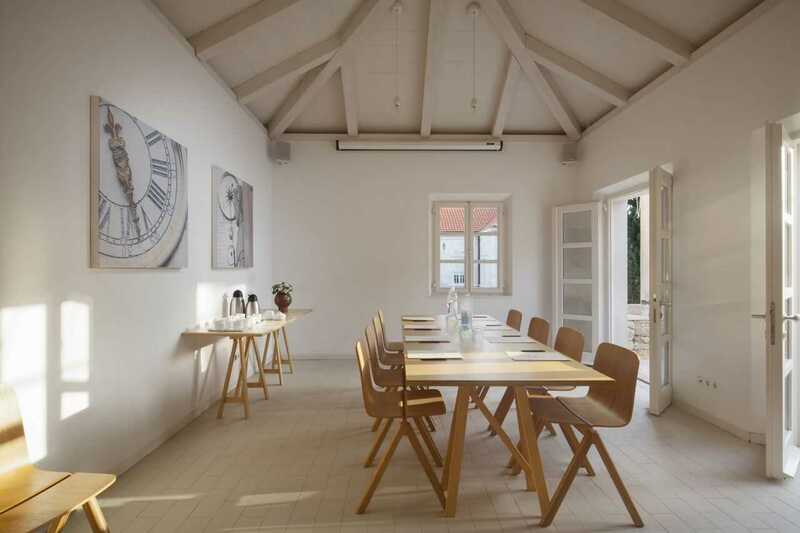 Moments spent here, whether just chatting or tasting wines, will certainly remain unique memories. 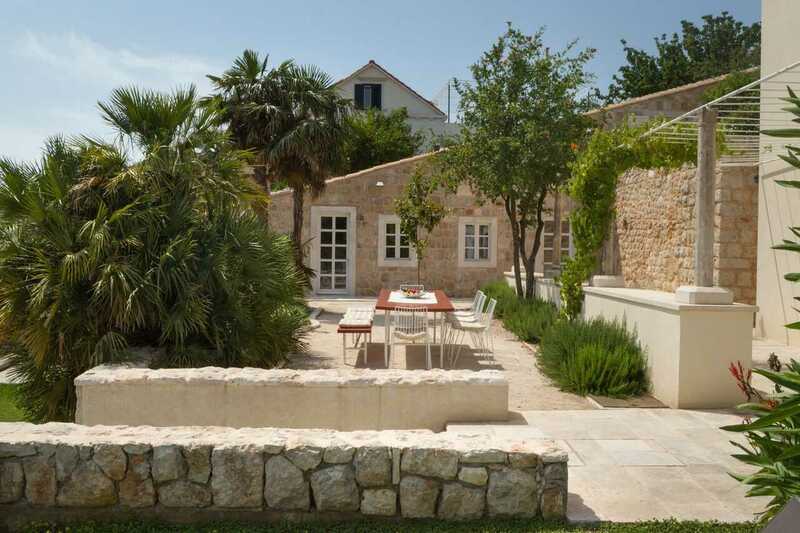 Several smaller terraces surround the house on the upper side, featuring lounge chairs and tables. 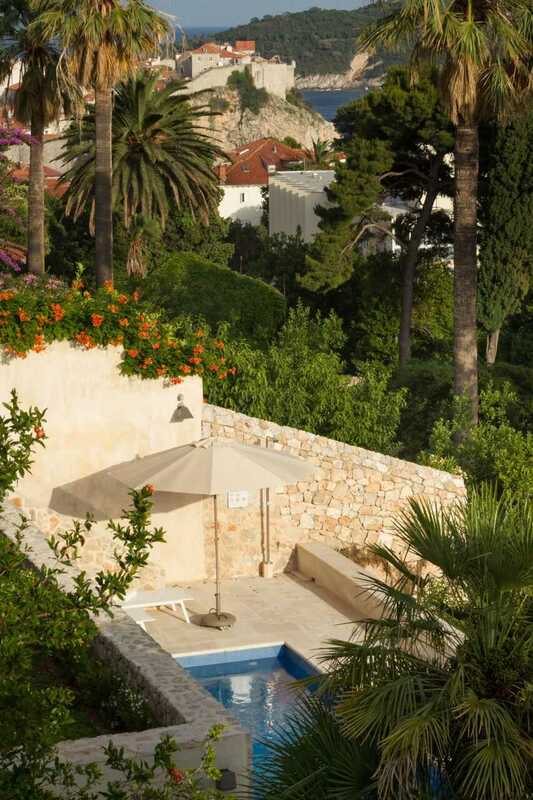 Absorb so many relaxing moments on the backdrop of meditative vistas of Luxury Villa Dubrovnik Old Town with pool gardens, elegant cypresses with the Adriatic view. The master house represents a classic town residence from the 19th century, comprising of three floors and 4 double bedrooms. 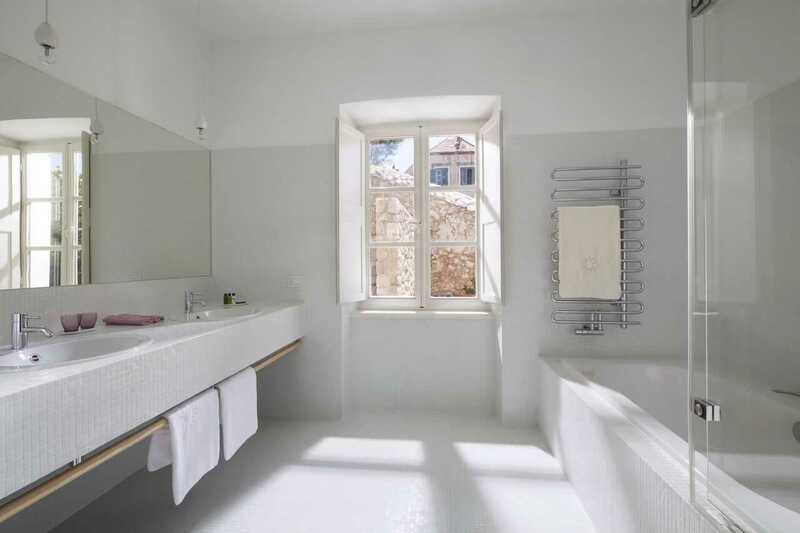 Restored with the utmost respect for its past, the interior retains not only certain original details, but also the historic spatial disposition typical of Dubrovnik homes. 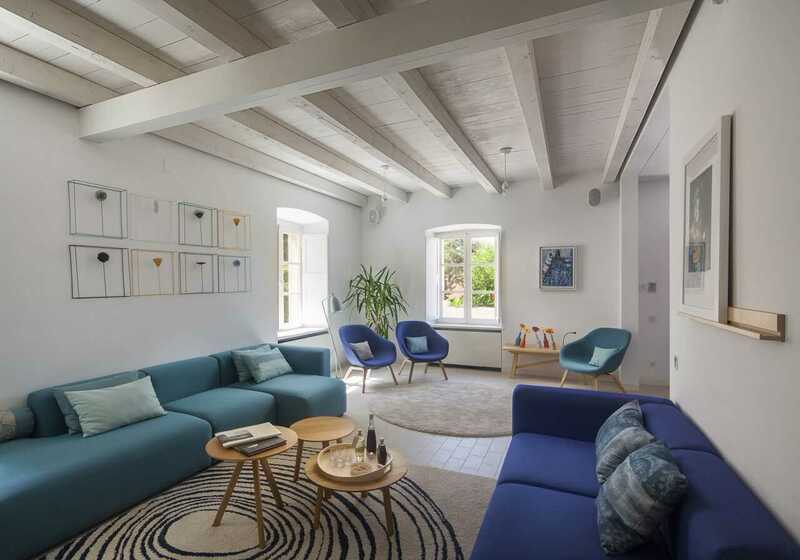 The décor remains simple, occasionally even minimalist, leaving it up to each guest to add personal touches, making it feel even more like home. Entering from the front promenade, immediately under the bougainvillea shade, the ground floor level is an open area hosting common spaces. 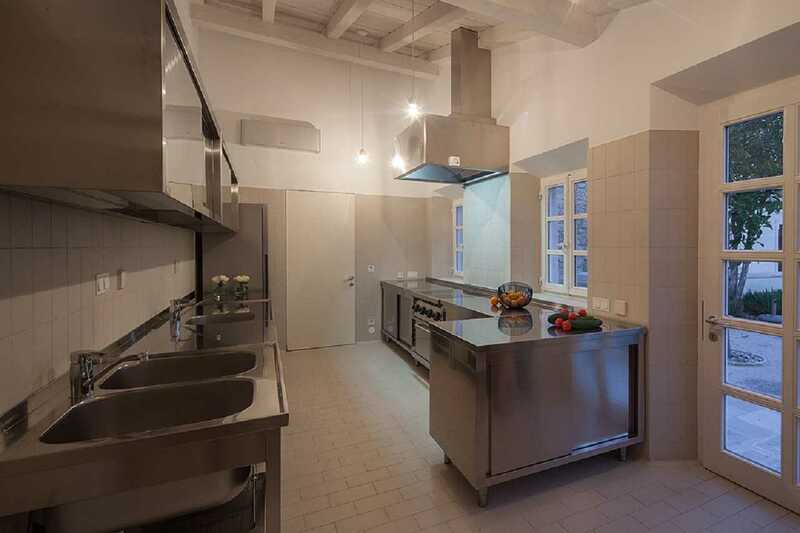 To the left, a custom designed and fully equipped home kitchen is highlighted by the central, large dining table. 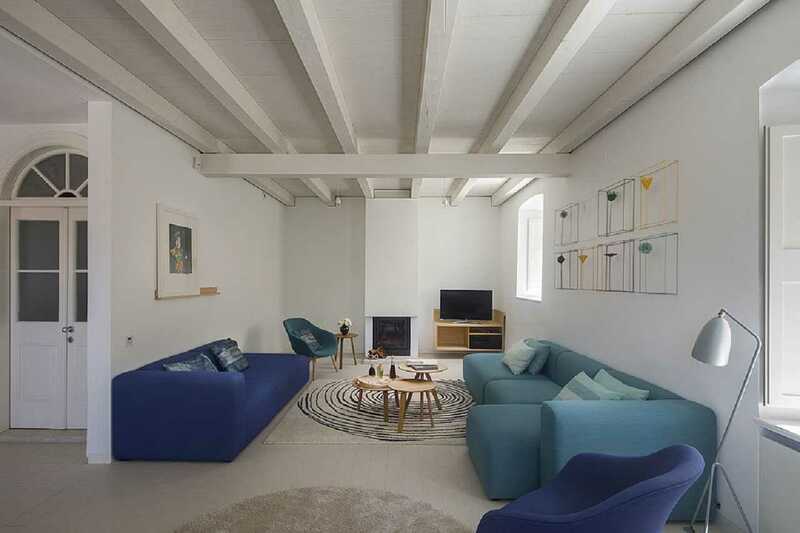 To the right, the living room with a fireplace and TV contrasts blue shades of its Norwegian style furniture with a neat, bright white backdrop. 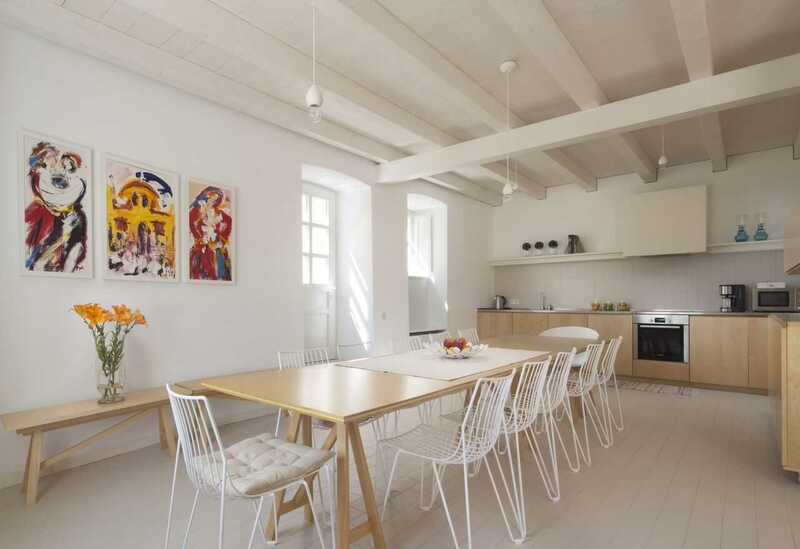 Pass the historic, double doors, the central stone staircase with decorated ceilings takes you up to the first floor level. 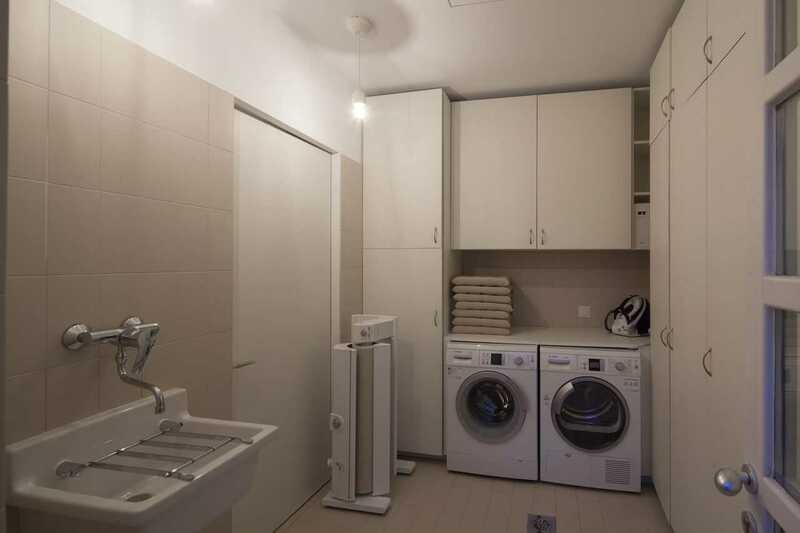 The central area of this floor is a common hallway – almost like a petite salon – with four doors, leading to two bedrooms and their adjacent bathrooms. 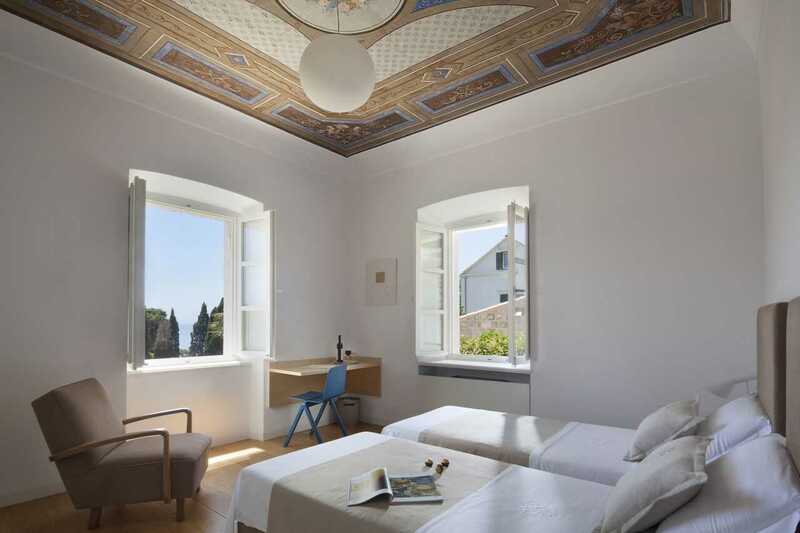 The bedrooms have a mirror layout, and both feature beautifully restored 19th century ceiling paintings with floral motifs and lush views of the Villa’s gardens. 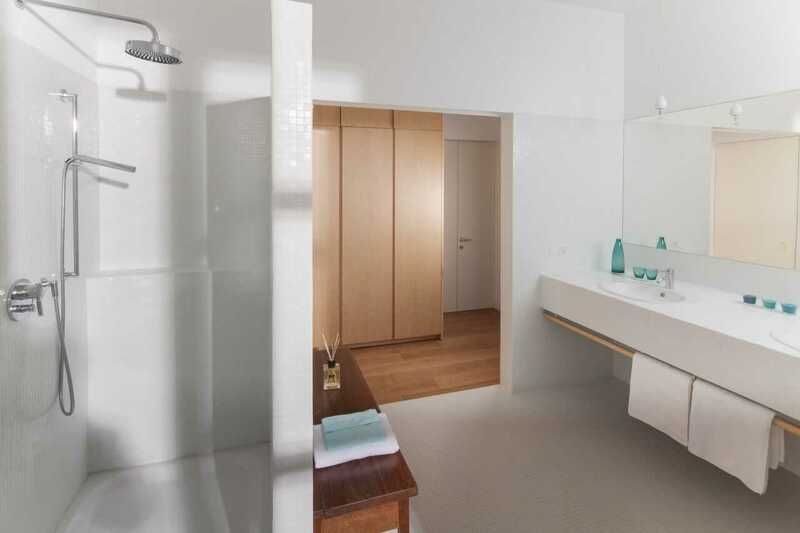 Their incredibly spacious bathrooms with double lavatories, one with a bath, and the other with a walk-in shower, sport a minimalist style and a white theme. 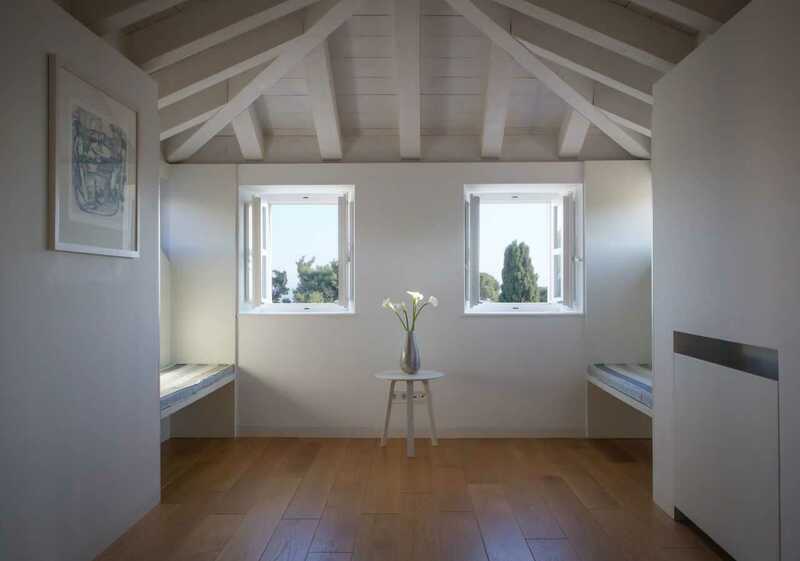 With everything unnecessary excluded, these rooms resonate a relaxed atmosphere. 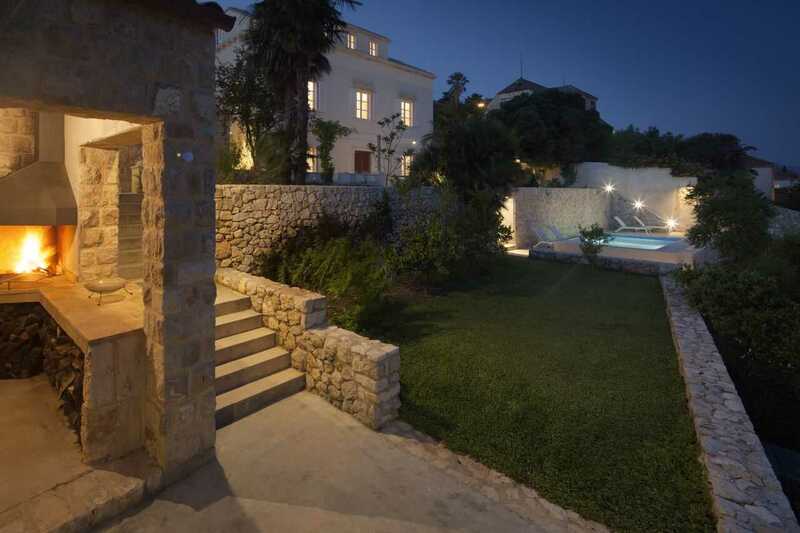 Leading up to the second floor of luxury villa Dubrovnik, the historic wooden staircase diverts half-way. 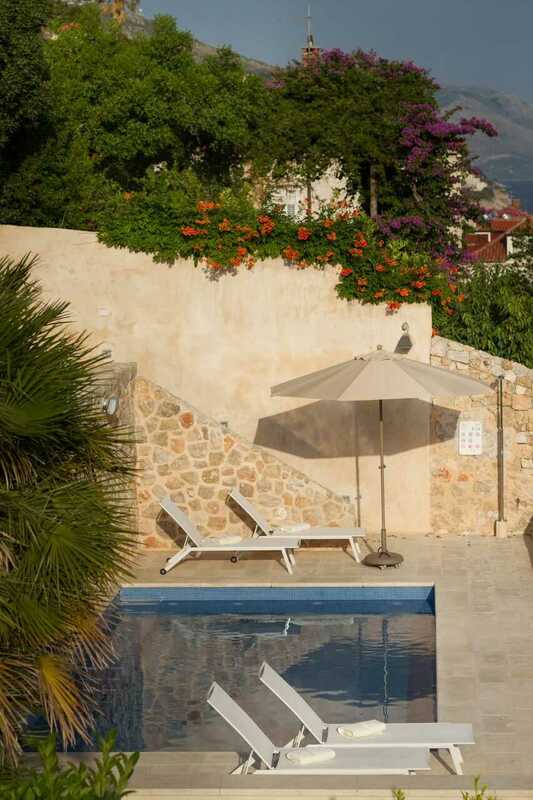 This exits onto a small bridge leading to the terraces above the master house – much like a secret private entrance from the upper side of the Luxury Villa Dubrovnik Old Town with pool. 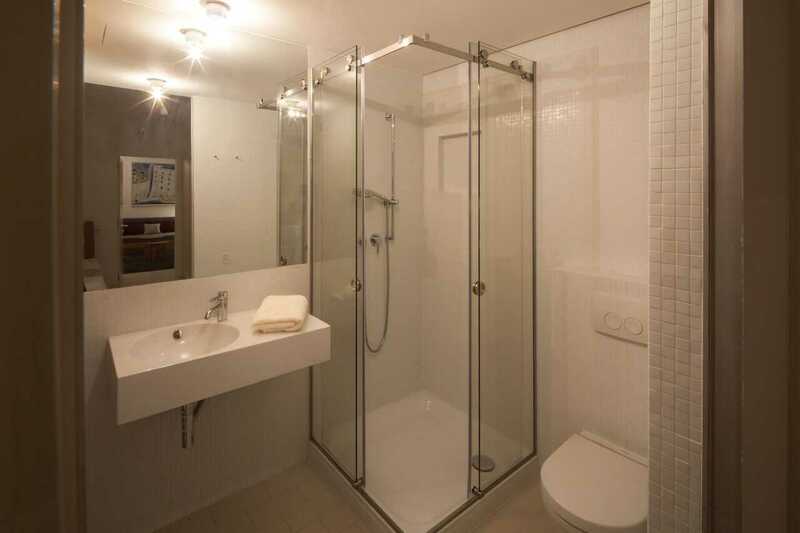 The second floor layout is very similar to the first, with a central, wood-lined reading area, and two double bedrooms on each side, both with a walk-in shower bathroom. 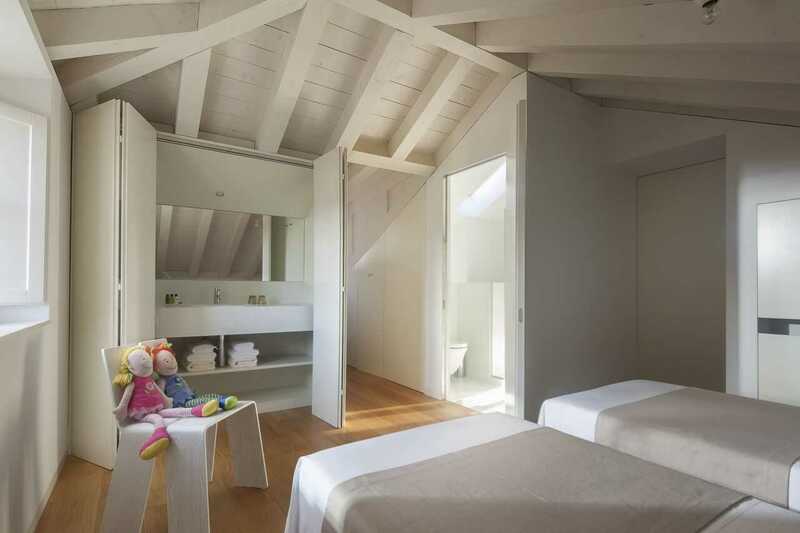 Many agree, the roof-sloped ceilings and exposed wooden beams shape a touch of romance to this floor. 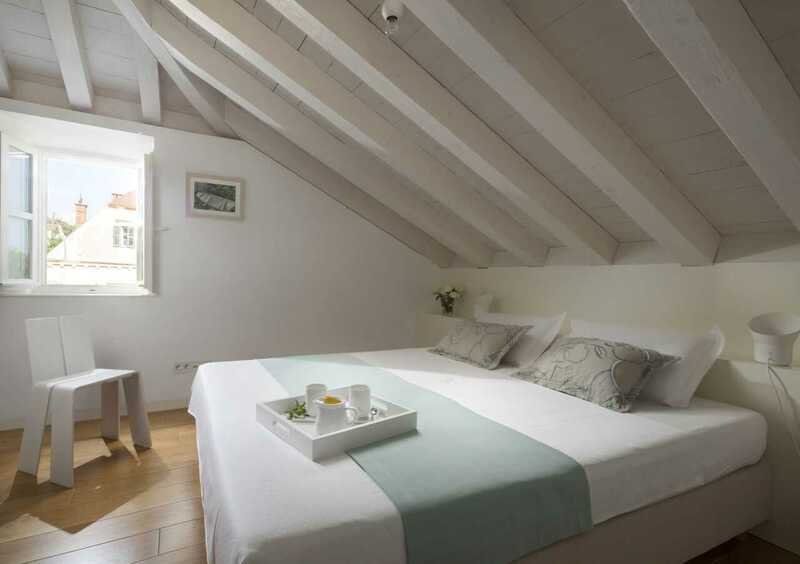 While the room facing the west overlooks the gardens, the room facing the east enjoys mesmerizing panoramas of Dubrovnik’s Old Town.